When Jeff Davis was a detective with Peel Regional Police in Ontario, Canada, he traced a stolen car in the area to a woman in Louisiana. Davis contacted her, hoping to reunite the vehicle with its rightful owner. Instead, the owner, a 65-year-old woman, broke down. She said that she lent the car to her 16-year-old daughter, who wanted to take a post-high school graduation trip to Florida. She was killed in an accident on her way there. So why did Davis think he found this woman’s car, intact and more than 1,000 miles north of the accident? It turned out that criminals took the vehicle identification number (VIN) from the wrecked car while it was sitting in a junkyard, then created new VIN plates for a stolen vehicle of the same make, model, year and color. That was the car that found its way up to Canada, where it was discovered by Davis. “There’s more than one victim in a crime like this,” Davis told a crowded classroom in March while teaching NW3C’s VIN Cloning and Motor Vehicle Title Fraud seminar at the Henrico County (VA) Public Safety building. The day-long training provided participants with a primer on VIN cloning, a variation of auto theft that is growing quickly in popularity among criminals. Davis opened the day by providing an overview of VIN cloning, including a history on vehicle identification’s evolution and how to decipher the string of 17 alphanumeric characters that comprise the VIN. 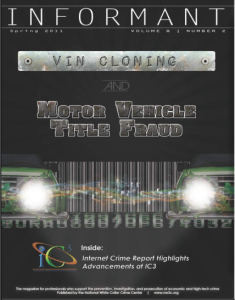 From there, Davis outlined the many schemes perpetrated by VIN cloners, including using another vehicle’s VIN or creating a counterfeit number, and describing how criminals execute the scheme. Davis also detailed the relative ease with which criminals can duplicate and forge everything from VIN plates to vehicle titles using computers, label makers, laser printers and even daisy-wheel typewriters. “A printer is worth a thousand words,” Davis said. Prior to the implementation of the National Motor Vehicle Title Information System (NMVTIS), it was much easier for scammers to re-register VINs. Davis recalled the case of one VIN that was registered in four states and two Canadian provinces at the same time. Todd Brighton, the enforcement coordinator with the Bureau of Justice Assistance, provided a detailed overview of how NMVTIS benefits law enforcement agents as the starting point in vehicle-related crime investigations, providing a conduit for exchanging information electronically and increasing the accuracy of state Department of Motor Vehicles data to identify cloned vehicles prior to title issuance. Davis walked the class through conducting VIN cloning investigations, and factors that should raise a red flag, such as when the driver doesn’t have identification, the car was sold for significantly less than retail price, and cars were titled under false names or addresses. He also taught the participants how to read the bar codes of VIN plates with the naked eye, translating the block of fat and skinny black lines into either the full number or the final eight digits, which are enough to provide vehicle identification. Davis warned that the number of law enforcement agents dedicated to auto theft are dwindling rapidly. The Toronto Police Service, which once had 32 agents in its auto theft unit, today has just two. Police units in Cleveland (OH), Chicago (IL) and Milwaukee (WI) have none, he added. “If you get an opportunity to do an auto theft case, take it,” Davis said.